We have introduced block room types, which are STATIC and DYNAMIC. Static block room types cannot be adjusted or changed through the calendar and Dynamic block room types can be changed through the calendar. View this info on the Block Rooms tab, under menu item Admin > Business Structure > select rooms type> click the Edit/View Selected button>click on the Block Rooms tab and highlight the block item to edit. 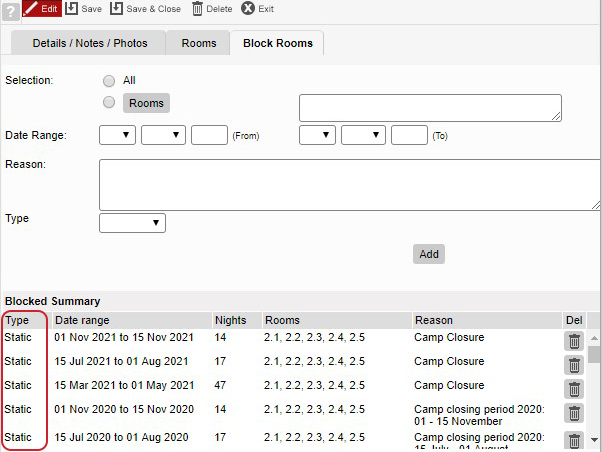 We have developed a streamlined way for you to move availability to different rate room duplicate with our new Our Open and Close out rooms functionality, this will now make blocking booking process a breeze, allowing you to transfer availability to different rooms this new feature allows you to filter down to room types and move your blocked rooms filter down to accommodation type. We have now adding profiling to your Occupancy Calendar, allowing you to create and save profiles for your convenience.